This is becoming a familiar feeling -- the Bulls' season cut short by LeBron James. I've thought about this a lot over the last week or so once I saw the writing on the wall that this team just didn't have what it would take to get past James and company, yet again. As much as we love the Bulls and as much as they have improved the roster -- probably the best roster they've had in the Tom Thibodeau era -- they never found an identity this season. They were never able to identify a true leader on the court, and they struggled pairing Thibodeau's defensive mind-set with a focus on making the Bulls a better offensive team. Their skill on the roster and on the bench got them as far as they could possibly go, but it was clear to me that this team was floating more often than not. Not only did they struggle to score at times, but they looked completely lost on offense for entire quarters. Here are my grades for each player this season. It will be interesting to see which, if any, pieces get moved around in the off-season. We did not see much from E'Twaun Moore, Doug McDermott, Nazr Mohammed or Cameron Bairstow this season, but with the need to clear some cap space, we could see more of the first two next year and possibly not see the latter two on the roster at all. I think it's unlikely that Thibodeau returns next year, and I'm guessing we'll see a few roster changes, but I don't know how much better the Bulls can be with the roster structured the way it is now. 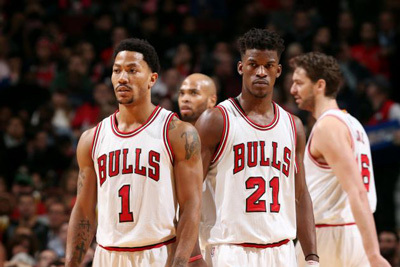 With Jimmy Butler likely to receive a max deal and Derrick Rose's max contract still on the books, we'll only see minor moves unless a trade is made. It should be an exciting offseason full of speculation, but it appears for now that any improvement the Bulls make will have to come from within.